Calvin's first ever Solo and Ensemble event was held today. It was a long day for him, appropriate after a long period of preparation. Long mostly for us parents, I suppose, who tried to convince the kid to get down to practicing in earnest back in December, and instead had to listen to his cries of despair ("I'll never get this ready in time!!!") just two weeks ago. Teenage (or preteen?) lessons are rarely learned the easy way I am finding. But he has a lot to be proud of in his no-nonsense work since that moment of panic (and a few mini panics between), because when today was finally here he was, if not in possession of the confidence that long practice brings, at least well prepared. 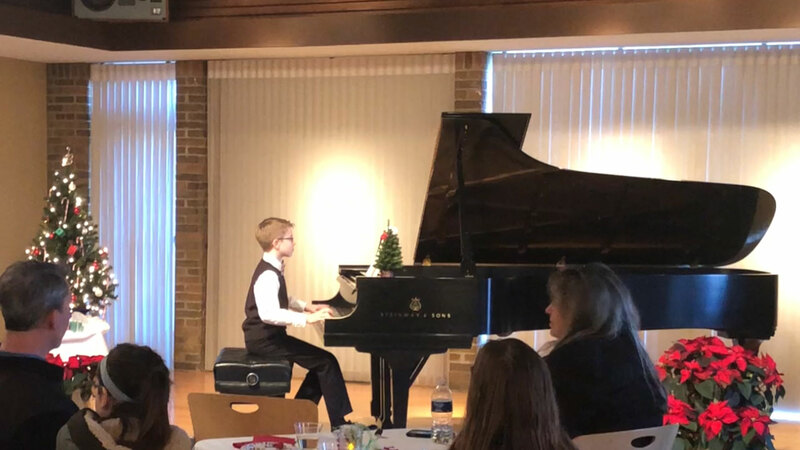 He played a bassoon solo, a bassoon/clarinet duet, and a piano solo, and he played them all well. His bassoon judge sounded very pleased when she told him that one of her undergraduates was playing the same solo piece for his juries, and she was amazed to hear Calvin play it so very well. Later, his piano judge told him he clearly had "this piano thing down" and that he "must have a very good teacher", to which Calvin and I both inwardly giggled, I think. He came home with three Division I ratings and a newly invigorated dedication to his instruments. Sonatina (Op. 20, No. 1), 1st movement - Friedrich Kuhlau — Calvin's first performance by memory!